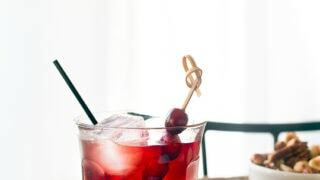 New York Sour: a red wine and whiskey cocktail with a bright and refreshing lemon simple syrup. This is one of those cases where you order the weirdest-sounding drink on the menu, and then become pleasantly surprised. Then, you pass your drink around the entire table because everyone just has to taste this funky combo of red wine and whiskey (yes, in the same cocktail! ), and by the time it makes its way back to you, it’s empty. Enter: round two. A whiskey sour was my first legal drink that I ever ordered at a bar. Side story: My first-ever drink at a bar was a frozen margarita with my parents (when I was growing up in Texas, an adult could order drinks for a minor…not sure if that’s still the case, but my Dad hooked.me.up back in the day! Thanks, Dad!). My first illegal drink at a bar was a mango margarita, but we won’t go into the story about how we found a bar in a college town that didn’t card (and subsequently hit it up every weekend of freshman year. Yikes). Back to the main story: on the day of my 21st birthday, we hit the bar at 7pm, and I ordered a whiskey sour. I reached for my wallet to proudly display my ID…only he never asked. I should mention that Hurricane Katrina was blowing down the road at us, and after one round of drinks, we quickly headed to the HEB to stock up on gatorade and batteries. It was an uneventful 21st birthday, but at least I learned to love whiskey sours. I also learned that a category 3 hurricane on land will, in fact, make it rain sideways. And that you and your hippie friends from the commune should definitely not go outside in sideways rain. I digress. The New York Sour is basically a whiskey sour with a dose of wine. I used a fruity light Pinot Noir, and my husband said this drink reminded him of sangria. In order to impress your Thanksgiving guests, pour the wine over a spoon to keep the red and yellow layers in the glass. I garnished with cranberries because they’re festive (and languishing in my fridge currently). I hope you have a wonderful Thanksgiving! Eat lots of turkey for me, be sure to make my Melting Sweet Potatoes with Maple-Pecan Sauce and keep your stretchy pants in the top drawer, because when you get back, it’s going to be all holiday cookies, all the time. You’ve been warned! 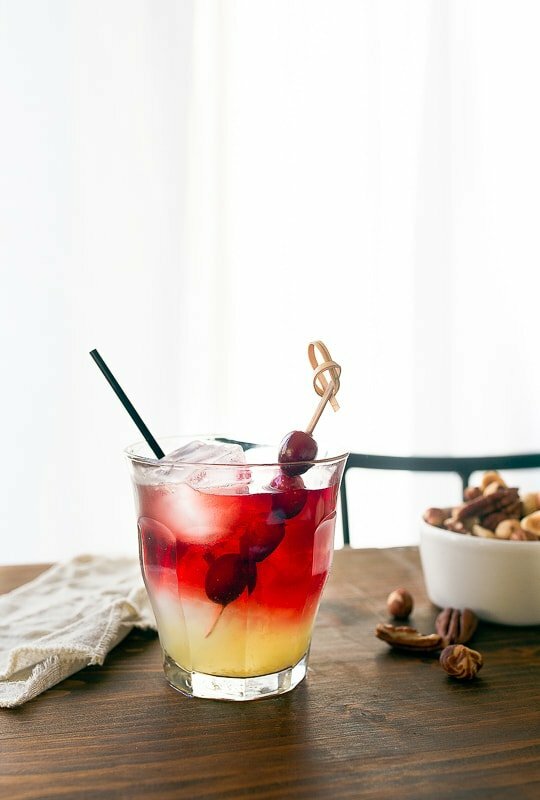 A New York Sour cocktail is a whiskey sour cocktail with a dose of fruity red wine. First, make the lemon syrup: in a small saucepan, combine the sugar, water, lemon zest and juice. Bring to a simmer and stir to dissolve the sugar. Let cool. Divide the lemon syrup mixture into two glasses. Add ice on top. 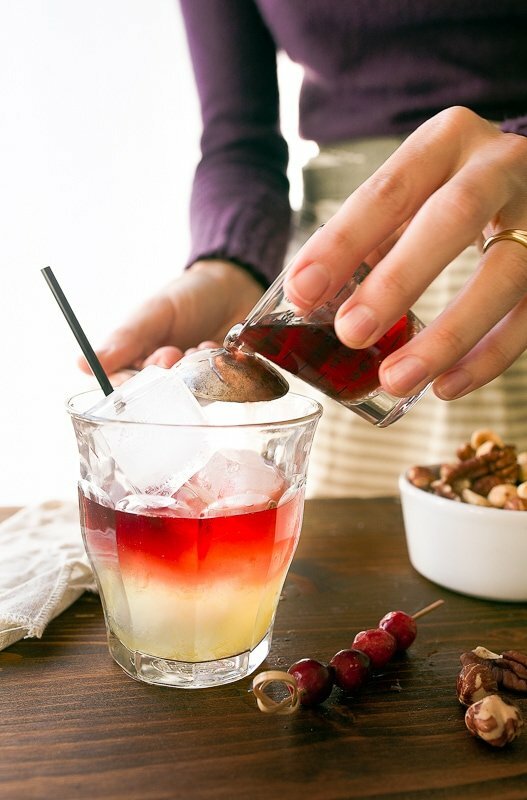 Combine the whiskey and red wine in a separate glass, and then pour it over a spoon into each glass with the lemon syrup (see photos for reference).